15% Off Weeknight Rates, Ring Gold Treasure, Sleeps 6. Pet friendly. Welcome to Ring Gold Treasure The living area features a wood burning fireplace. The television is a digital antennae that gets plenty of channels. A perfect spot to relax. Eat-in kitchen that opens up to the back deck. Eat-in kitchen that opens up to the back deck. Yes, you will be cooking with gas Kitchen Ready for dinner Located in Ringgold, 22 miles from downtown Chattanooga. Welcome to Ring Gold Treasure The view from the road. King bedroom. King bedroom. One of the queen bedrooms. The second queen bedroom. Full bathroom. Full bathroom. The deck is off of the back of the house. The view from Ring Gold Treasure`s deck. The view from Ring Gold Treasure`s deck. Sit back and relax Check out the view Beautiful. Beautiful. Full laundry facilities. 25 miles to Rock City. Beautiful views from the back deck. In historic Ringgold, Georgia. 22 miles from downtown Chattanooga. No internet. Bring your hot spot! This little treasure in the historic town of Ringgold, GA is only 22 miles to downtown Chattanooga. This cozy 3 bedroom, 2 bathroom house is nestled in a quiet neighborhood and perched on top of a ridge with a gorgeous view from the back deck. Snuggle up by the fireplace, grill on the back deck, or just relax and take in the view that overlooks the foothills of the Chattahoochee National Forest. Located in a safe neighborhood, you can be assured that you will feel right at home! The updated eat-in kitchen features stainless steel appliances including a dishwasher, microwave, oven, stove, refrigerator, and a well stocked kitchen to make cooking meals a breeze! For coffee lovers, the kitchen has both a drip coffee pot as well as a Keurig. The dining table has room for 6, making this the perfect home for a small group or family. The master bedroom suite features a king sized bed with its own private bathroom. The other two bedrooms each have a queen bed and share a bathroom off the hallway. The house also has a washer/dryer for your convenience. Please note that there is NO INTERNET at the home. Past guests have successfully used hot spots. The television is digital antennae only that tends to pick up a lot of channels. 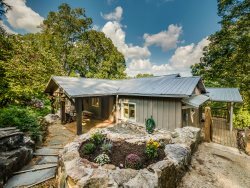 Enjoy this cozy home away from home with an amazing view, quaint furnishings, and quick drive to nearby Chattanooga. You won’t be disappointed! We were not there very long but enjoyed out stay. The property was very clean and management was easy to work with. The driveway is a little steep. Thank you everyone was very helpful. Everyone I talked was very nice, helpful, and efficient. They did a great job making check-in and check-out an easy process. We really enjoyed our stay. It met our needs for the weekend perfectly and we had a relaxing time while we were there. I really appreciated that there was not a long list of things to do prior to checking out beyond just leaving the property the way we found it. It is always hectic trying to get on the road and get out before the check-out time, so it was a very pleasant experience to not have to fret over a long list of things to be done before we left. We will definitively book a stay here in the future! Upon completion of a reservation, Chattanooga Vacation rentals will be contacting you to confirm all details of the reservation. This will include verification of the dates, the property, the number of people coming as well as a request for your identification in the form of a drivers license and a picture of your self (a selfie). This is a step we use to prevent fraud and to ensure the guest is of proper age to rent from us.